Designer Gothic Bracelet For Women : LOVE2HAVE in the UK! 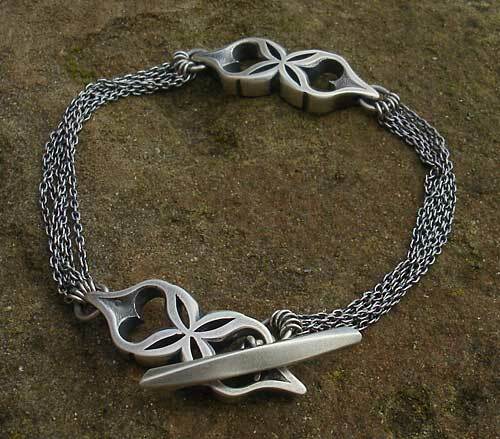 This women's designer Gothic silver bracelet is an adaptation of the other 'Saint & Sinners' bracelet listed. Again it is a lovely designer Gothic bracelet with some fabulous ornate and very unusual styling featuring Gothic hinge parts with unique heart shapes. There are two large pairs of the tip to tip Gothic hearts attached to each other by rows of oxidised chain. The silver has an oxidised finish in the recesses of these parts. They are held together with chains. Four rows of oxidised chains make up the bracelet. 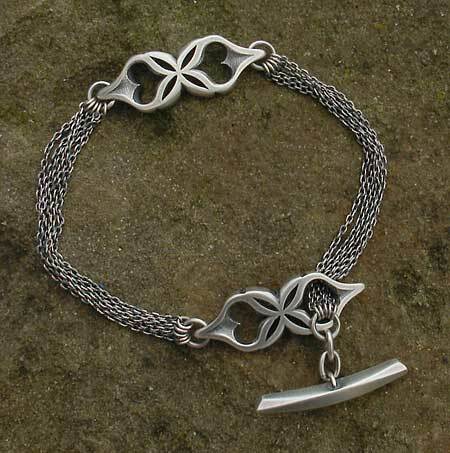 The total length of the piece is 8.5inches inches, and it is fastened securely to the wrist with a T-Bar clasp.